In the build up to Star Wars: The Force Awakens, fans were grabbing hold of any information that was available. When the first trailers hit, every moment was picked completely apart. One of the aspects that received a great deal of scrutiny in those early days was the lightsaber belonging to Kylo Ren. The crossguard design was something that had never been seen on screen before, and many fans viewed the idea as impractical. But according to one of the concept artists on The Force Awakens, the design was necessary as a way to tell you more about the character. Doug Chiang is a life long Star Wars fan who worked with George Lucas on the the prequel trilogy. When he learned that new Star Wars films were going to be made, he immediately wanted to be part of them. One of aspects that Chiang says is important in creating the aspects of the Star Wars universe is that everything needs to have a reason for existing. 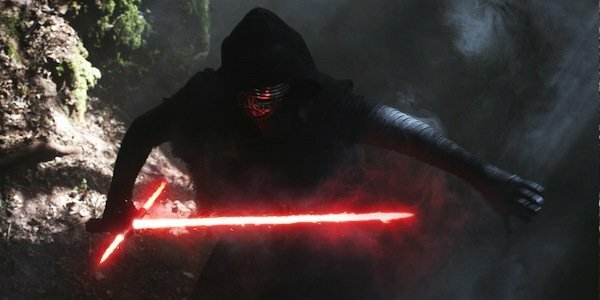 While not all reasons are explained, Chiang tells Yahoo that the logic for Kylo Ren’s now iconic lightsaber was that it helped to tell you something about the character without the need for dialogue or exposition. Part of it is trying to create iconic visual images that help support the story of the character. Early on, J.J. had always described Kylo as this next-generation villain who’s going to be as bad as Vader, and as powerful. And he said, he’s kind of like a knight, a dark knight. So it works well, that the blade has a crossguard. You bring in those little elements that start to reflect the character. I love it when designs can do that, inform who the character is. And at the same time, I remember when I first saw the crossguard on the lightsaber, it put a smile on my face. It was so unexpected but felt right. I know it took risks of, how would you explain it? Would it be practical? You can explain that afterwards. Of course, Doug Chiang doesn’t go on to explain the practicality of the device; if they ever did explain that to themselves internally, it’s still a mystery to the rest of us. The practicality of the lightsaber crossguard, and the likelihood that you might accidently cut your own fingers off, was the primary criticism of the concept to begin with. While the crossguard did end up being used as an offensive weapon in Star Wars: The Force Awakens which was pretty cool, we still foresee the possibility of injuring yourself to be pretty high. At the same time, we have to agree that the lightsaber design successfully does exactly what it set out to do. From the second it appeared in the trailer, we knew Kylo Ren was the bad guy and the weapon is a large part of that, the crossguard makes the weapon look larger and scarier than your average lightsaber, so mission accomplished as far as that goes. Having now seen Star Wars: The Force Awakens and the new lightsaber in action, did they overcome your initial objections, or are you still annoyed with the entire idea? Let us know in the comments. Kylo Ren’s expected to be a MAJOR factor in Star Wars: Episode VIII. Even though the movie isn’t due in theaters until 2017, we actually know a ton of fascinating details about the Star Wars sequel. Some of them are spoilery, but all of them are great. Want to find out what’s up? Click on to the next page. And finally, Here’s Everything We Know About Luke Skywalker’s Plans In The Upcoming Star Wars Movies!